The Fort Lauderdale, Florida, area is a fantastic place to be for those who possess an artistic eye. In addition to galleries, art museums, and college campuses, the Design Center for the Americas is an important aspect of South Florida’s thriving creative community. This larger-than-life campus has attracted world-class designers, architects, decorators, and their clients for over 30 years. Here’s everything you need to know before visiting this must-see spot! Exploring the Design Center for the Americas is just one of many fantastic ways to spend time here. For a complete list of our favorite things to do in “The Venice of America,” be sure to request access to our complimentary Fort Lauderdale Vacation Guide! It has helped so many travelers plan the perfect South Florida getaway. The 800,000 square foot Design Center for the Americas is the largest campus of its kind. This is the place to go to discover fresh ideas for designing and decorating any home, yacht, or office space. In this spacious building, visitors view countless iterations of furniture, fabrics, flooring, lighting, appliances, bathroom features, window treatments, paint, and so much more. The DCOTA is part of the Cohen Design Center quartet, which consists of sister locations in Manhattan, Hollywood, and Houston. Find the Design Center for the Americas at 1855 Griffin Road in Dania Beach, Florida, just 11 minutes south of Fort Lauderdale. Admission to the showroom is free, but you may want to pick up a directory booklet from the concierge desk. This helpful resource costs $13 and provides you with everything you need to know as you navigate the enormous Design Center. Another fantastic feature of the DCOTA is its first-floor atrium, the perfect place to host a wide variety of events! If you’re planning a corporate function, luncheon, gala, or cocktail reception, this is large and visually stunning venue is a great choice. Finally, the Design Center boasts an on-site, fine dining restaurant where you and your associates can enjoy delicious contemporary American cuisine. The restaurant is open Monday through Friday between 11:00 a.m. and 4:00 p.m. Be sure to view the menu before visiting! Stay Nearby in a Private, Beautifully Decorated Vacation Rental! Whether you need to decorate your yacht, design a brand new home, or simply pick up a few items for your office, the Design Center for the Americas is a must-visit. Instead of staying in a cramped, cold hotel room, why not stay in style? 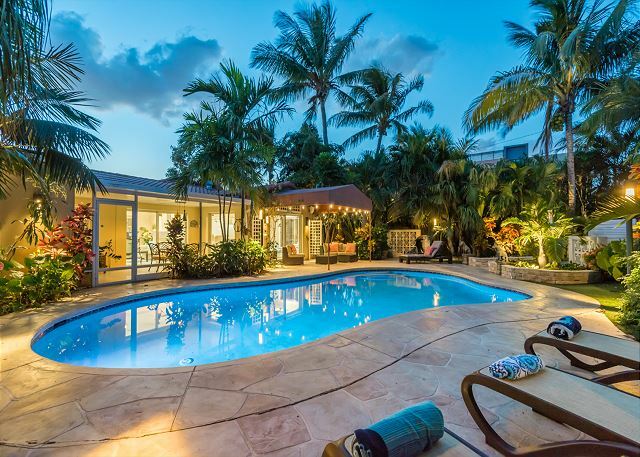 A Fort Lauderdale Stays vacation rental is the ideal way to do just that. Our homes are located in the city’s best neighborhoods and feature stunning architectural details, picturesque heated pools, tropical backyards, and incredible views. You’ll love our premium amenities like complimentary Starbucks coffee, fully stocked kitchens, all-natural toiletries, and premium concierge services. We recommend checking out our Poinsettia Heights or Victoria Park properties, which are less than 10 minutes away from the Design Center! Plus, they’re close to all of Fort Lauderdale’s best things to do like visiting the Museum of Art and viewing historic structures like the Stranahan House. Here Are Some of the Best Bike Tours in Fort Lauderdale — Here Are Some of the Best Fort Lauderdale Stadium Events!